In Zapata’s shadow, Minneapolis says “Yes” to refugees | Fight Back! 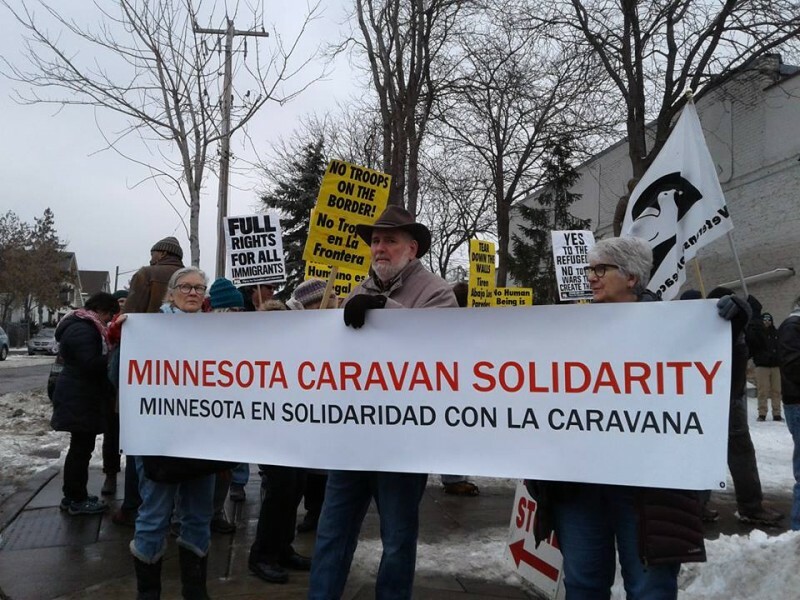 Minneapolis, MN - A sizable crowd gathered at the base of the statue of Mexican revolutionary Emiliano Zapata at South Minneapolis’s Plaza Centenario, February 2, for an event titled “Rally Against the Wall.” The demonstration was initiated by Minnesota Caravan Solidarity/Minnesota en Solidaridad con la Caravana, a coalition of international solidarity and immigrants’ rights groups in Minnesota’s Twin Cities. About 90 demonstrators chanted in support of the refugees travelling in large groups from Central American countries like Honduras, Guatemala and El Salvador to seek asylum at the U.S.-Mexico border and condemned President Trump’s racist anti-immigrant views. Brad Sigal of the Minnesota Immigrant Rights Action Committee (MIRAC) was an emcee of the rally. During the rally he said, "Today is the anniversary of the Treaty of Guadalupe Hidalgo, an unjust treaty that the U.S. forced Mexico to sign at gunpoint in 1848. In that treaty the U.S. took half of Mexico's territory, which became what's now the southwest of the U.S. When they say 'we didn't cross the border, the border crossed us,' it's literally true. The border was created by a historical injustice and it should not have a wall and should not be militarized. We demand legalization for all." Protesters connected Trump’s antagonism toward the refugees from Central America with longstanding, U.S.-fueled destabilization of that region. 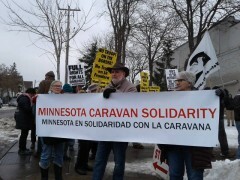 “We demand the stop of the U.S. support for the corrupt and criminal regime of Juan Orlando Hernández – “JOH” – sustained by army and police, trained and financed by the U.S. government and, some allege, Israel, Colombia and other right-wing governments in Latin America,” said Marcial Castro of Minnesota Hands Off Honduras. Morales also pointed to the need for drivers licenses for undocumented people living in the U.S., a long-running demand of immigrant rights groups in the Twin Cities. Demonstrators spoke with passersby along busy Lake Street in the heart of the heavily Latino neighborhoods of South Minneapolis. Chants included, “No ban! No wall! Legalization for all!” “Venezuela is under attack! What do we do? Stand up fight back!” and “¡Zapata vive! ¡La lucha sigue!” – Zapata lives! The struggle continues!